While sweat glands are designed to aid with cooling in humans, heat release does not occur in dogs this same way. Dogs lack the normal, predominant sweat glands that humans and other species have. How do dogs cool off? While dogs have a small amount of sweat glands (which are prominently in the paw pads), their primary source of heat exchange (i.e., getting rid of heat) is by panting. Vasodilation (i.e., dilating of blood vessels [which can cause a flushing appearance on the skin]) is another method. Lastly, they are capable of sweating a little via their paw pads. Panting is the primary method, while vasodilation is likely the second most important. Vasodilation helps bring hot blood directly to the surface of the skin, allowing for the blood to cool before returning back to the heart. As for heat release and sweating through the paw pads — as a veterinarian — I think this is relatively rare and uncommon. I work with a lot of fit, athletic dogs (e.g., Greyhounds and sled dogs) and have yet to see a dog’s feet sweat much while exercising. So, yes, while your dog has some sweat glands there, it’s likely a minor method of heat release. 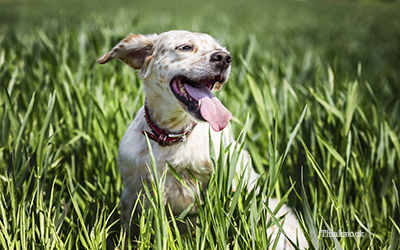 Make sure to exercise your dog very early in the morning or at the end of the day, when the heat index is low. Carry your dog’s tennis ball back for him. Why? When your dog has been chasing the tennis ball for the past 30 minutes, he can’t cool down and blow off all that heat when he has to carry the ball back home. Lugging his own tennis ball in his mouth may occlude his ability to pant well, and can make him overheat. Be a good owner and carry the toy back for him. Although dogs do sweat a tiny bit, it’s not enough to be a primary way of staying cool. Always exercise your dog appropriately and safely.